Stone Roses bassist Gary 'Mani' Mounfield has insisted the band are not reuniting to make money. The reformed quartet have buried their differences and will play a series of lucrative dates around the world, but Mani said cash wasn't the motivating factor. "It's never been about the money. I've been out constantly on tour for the last 15 years since the Roses finished and I get stopped in every city of every country of the world every day and asked by people will it happen," he said. "People have got dreams that they probably want to see happen. It would be nice to satisfy their dreams and get it done." 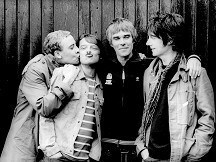 Frontman Ian Brown added: "The money's always been on the table - we could have taken that money any time we wanted. Every year, two, three times a year we've had offers all the way down the line." The band - famed for tracks such as Fool's Gold, I Am The Resurrection and I Wanna Be Adored - had a huge surge of success following the release of their first, self-titled album in 1989. But tensions mounted within the group during the five years it took to release a follow-up, and in 1995 guitarist John Squire and drummer Alan 'Reni' Wren quit. The band limped on with replacements but eventually folded in 1996. Ian - who went on to carve out a successful solo career - said during the press conference to mark the reunion that although there had been "hurt" in the years since the band went their separate ways, there had never been any "hate".